MT. ZION – Plan, prepare, protect – that’s the motto of a new firearm training facility recently established in the greater Decatur area. Mt. Zion’s Midwest S.W.A.T. (Simulated Weapons Advanced Tactical Training) holds simulated training programs for new gun owners on up to military or law enforcement officials. Tactical Combative Instructor Jeff DeVore says they saw a need for an establishment like this due to the high number of people seeking concealed carry permits. DeVore says S.W.A.T.’s services go beyond concealed carry classes. They can teach the basics of how to hold and shoot a weapon,to full-blown law enforcement training procedures, or school or theater shooting tactics. It can be scary seeing someone with a weapon, DeVore realizes, but that’s what the S.W.A.T. facility is for. Students don’t actually shoot any live rounds at the S.W.A.T. facility – instead, instructors teach them decision making along with holding simulations. DeVore offered the example of being in a restaurant and having a shooter come in. S.W.A.T. is partnered up with Shooter School out of Atwood which is where people go to shoot live rounds. DeVore says they have top-quality trainers available, making the partnership beneficial for both parties. DeVore says their simulators are almost like video games, but it serves a much greater purpose than having fun. The training facility is only holding special request classes at the moment, and they will kick off new classes starting in April. S.W.A.T. 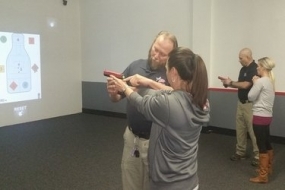 will offer classes like their Skill Builders Series, Active Shooter Series, Concealed Carry classes, All Ladies Series, Junior Firearm Safety Series, and Self-Defense Seminars. Midwest S.W.A.T. is located at 160 Wildwood Drive in Mt. Zion next to Family Video. For more information and to learn about what they have to offer, you can check out their Facebook page, or their website here.